A dark blue jasper dip teapot dating from c.1900. 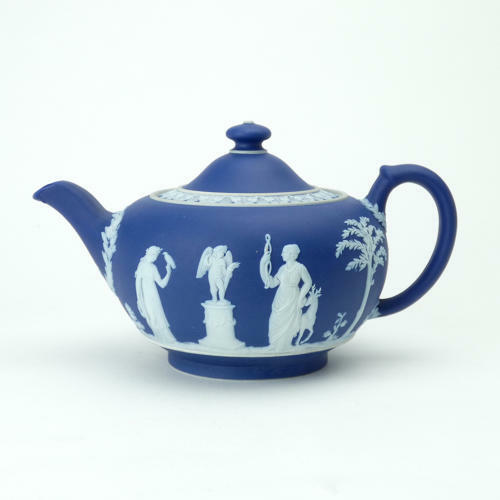 The teapot has impressed marks to the base which are 'WEDGWOOD' to one side, 'ENGLAND' to the other and there are a couple of workman's marks between. It has sprig moulded decoration which includes classical maidens offering sacrifices. There are various foliate borders around the handle, spout and the rim of the lid. The reliefs are all good quality and the jasper dip is a good, rich shade of blue. It is in excellent condition and it could be used.